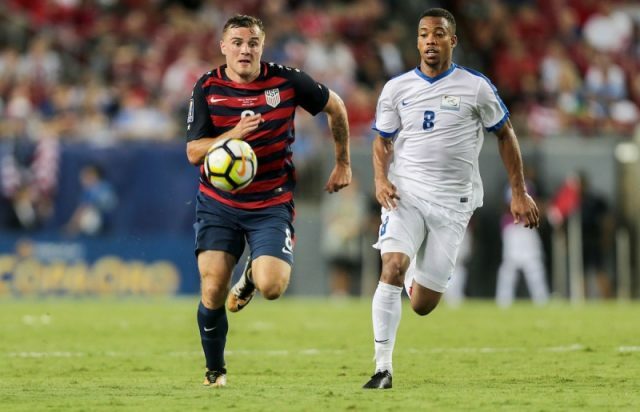 Jordan Morris scored a 76th minute winner for the United States as they narrowly beat Martinique 3-2 at the North, Central American and Caribbean Association Football Gold Cup today. Morris’ second goal of the game handed the Americans victory after they had squandered a two goal advantage earlier in the Group B match at the Raymond James Stadium in Tampa. Failing to break through in the first half, the US moved into a 2-0 lead in the second through goals by Omar Gonzalez in the 54th minute and Morris’ first on the 64th. But Martinique, a French territory, charged back into the match through two goals by Kevin Parsemain in the 66th and 75th minutes. The first was a long-range shot that flew past American goalkeeper Brad Guzan. while the second deflected in off Parsemain. However, the US had went back ahead just a minute after the equalizer as Morris killed off the spirited Martinique effort. Earlier today in Group B, Panama came from behind to beat Nicaragua 2-1 in Tampa. Carlos Chavarria put Nicaragua in front in the 48th minute after he fired a shot into the top left corner. They were not behind for long though as Ismael Diaz equalized for Panama almost immediately with a well-taken effort. Gabriel Torres then put Panama into the lead in the 57th minute. Following today’s matches, the US lead Group B with four points, in front of Panama on goal difference. Martinique are third with three following Nicaragua who have lost both of their matches so far. The top two teams in each of the three groups advance to the quarter-finals, along with the two best third-place teams.